MediMiss alternative treatments eye care eye diseases Eye Health Homeopathic Remedies homeopathy homeopathy and eye problems Homeopathy Treatment Top 10 Homeopathic Remedies for Eye Problems! Eyes are the doorway to one's soul! Eyes reflect mind, eyes reflect psyche, and eyes reflect HEALTH! No wonder homeopathy that caters effectively the 'mind' of an individual has lot to offer in problems of eyes. Eye is certainly one of the most delicate organs of the body and therefore, caring for eyes has to be done by an expert homeopath. A homeopath might want to consult an ophthalmologist to rule out certain critical eye problems before proceeding for the treatment. 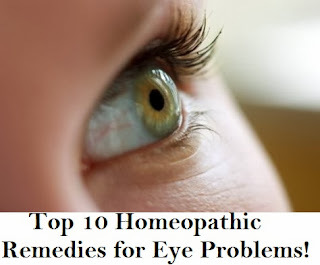 But here one should remember that while treating homeopathically, we should not give much importance to the diagnostic name of the eye problem but its signs and symptoms that point us to the accurate remedy. - Must be compared with Allium cepa while dealing with allergic rhinitis associated with conjunctivitis. In Allium cepa, eye discharges are bland and coryza is acrid. - Pulsatilla is one of the most invaluable homeopathic medicines for eye troubles.